March 17, 2016 – NASA’s Cassini spacecraft captured this view of Saturn’s moon Enceladus that shows wrinkled plains that are remarkably youthful in appearance, being generally free of large impact craters. 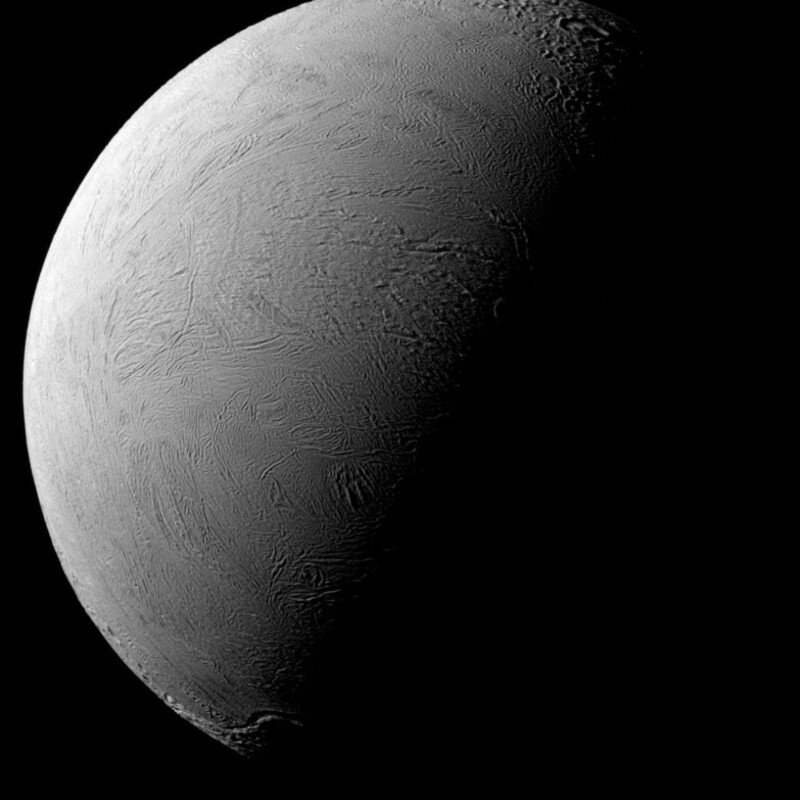 When viewed with north pointing up, as in this image, the day-night boundary line (or terminator) cuts diagonally across Enceladus, with Saturn approaching its northern summer solstice. The lit portion on all of Saturn’s large, icy moons, including Enceladus (313 miles or 504 kilometers across) and Saturn itself, is now centered on their northern hemispheres. This change of season, coupled with a new spacecraft trajectory, has progressively revealed new terrains compared to when Cassini arrived in 2004, when the southern hemisphere was more illuminated. This view looks toward the leading hemisphere of Enceladus. The image was taken in green light with the Cassini spacecraft narrow-angle camera on Jan. 14, 2016. The view was acquired at a distance of approximately 49,000 miles (79,000 kilometers) from Enceladus. Image scale is 1,540 feet (470 meters) per pixel.